August 1, 2012. 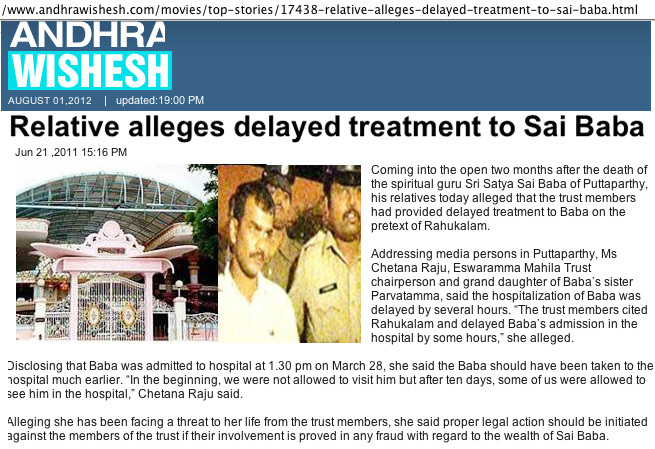 ANDHRA WISHESH web site posted an archived news item in which Ms. Chetana Raju, the granddaughter of Parvatamma, (Sai Baba’s sister) accused Sai Trust members of threats to her life! She also claims that – when he fell ill – the treatment of Sathya Sai Baba was unnecessarily delayed several hours by those in charge. The likelihood of members of the Sai Trust having made a death threat is far from low, considering the fact that Trust members in 1994 were involved in blackmailing the Puttaparthi police to shoot down in a veritable hail of bullets four intruders (armed only with knives) trapped in Sai Baba’s bedroom (this was confided to me by my close confidante – a very worried V.K. Narasimhan – who had been present to a discussion between then Home Minister an Sai-devotee S.B. Chavan and Sai Baba’s younger brother Janakiramiah where they laughed over the matter, saying “Dead men tell no tales”! Sathya Sai Baba was close by and was involved in discussions with Trust members which negotiated with police during the long stand-off between police and the trapped devotee intruders took place.